Alstare and Checa on top, Sykes closing in despite wrist fracture. Alstare Ducati’s Carlos Checa found himself at the top of the ‘testing leaderboard’ at the end of day 2 at Phillip Island. Checa, riding the all new Ducati 1199 Panigale, that was revealed last month, put in a time of 1.31.059, nearly 2 tenths quicker than Leon Camier’s time of day one. Walking wounded, Tom Sykes was very close behind the top 3, just over 2 tenths off Checa, despite riding with a fractured left wrist. Like with Camier, Sykes was testing machine and tyre set-up in preparation for Sunday’s race, but said to be enjoying himself on the bike, even though he “had been a little bit tense” following his crash last week. “I definitely used my injured arm a lot today because it has been sleeping. My crew chief has been doing a good job of waking it up. I know that the wrist has been knocked about and you can tell there is a crack in it, likewise the ribs are pretty sore, but I have every confidence in Kawasaki and all of the team.” Said Sykes. His team mate, Baz, ended up in 15th, also improving on his time from yesterday. Similarly to his team mate, Baz’s confidence was slightly battered following a crash in the previous test, though he is confident that he will improve further in Friday’s free practice sessions. Sykes was followed by Michel Fabrizio in 5th on the Red Devils Roma Aprilia, who beat his time from day one by 0.049 of a second. Fabrizio finds himself just ahead of a gaggle of Brits, in the form of Jonathan Rea, Leon Haslam and Eugene Laverty. Rea improved on his time from day one by 0.624, whilst Haslam and Laverty sit in 7th and 8th, using their times set yesterday. 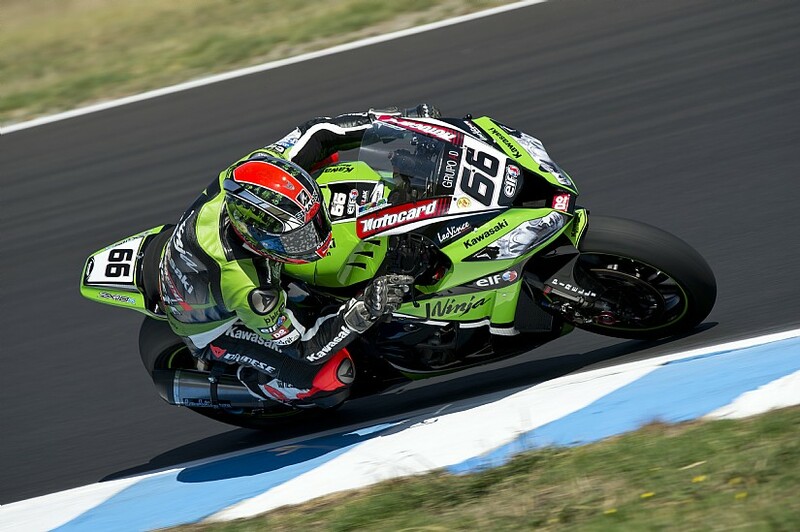 In 9th was Althea Aprilia rider, Davide Giugliano, improving by 6 hundredths, followed by Frenchmen Guintoli and Cluzel. Both riders significantly improved on their times from day one and lie in 10th & 11th. Cluzel is another rider regaining his confidence from a heavy crash on the island, last week. Combined times from Monday and Tueday below.